Registration is underway for a memorial golf tournament being held June 8 in memory of two Southwestern Electric Power Company (SWEPCO) power plant employees. 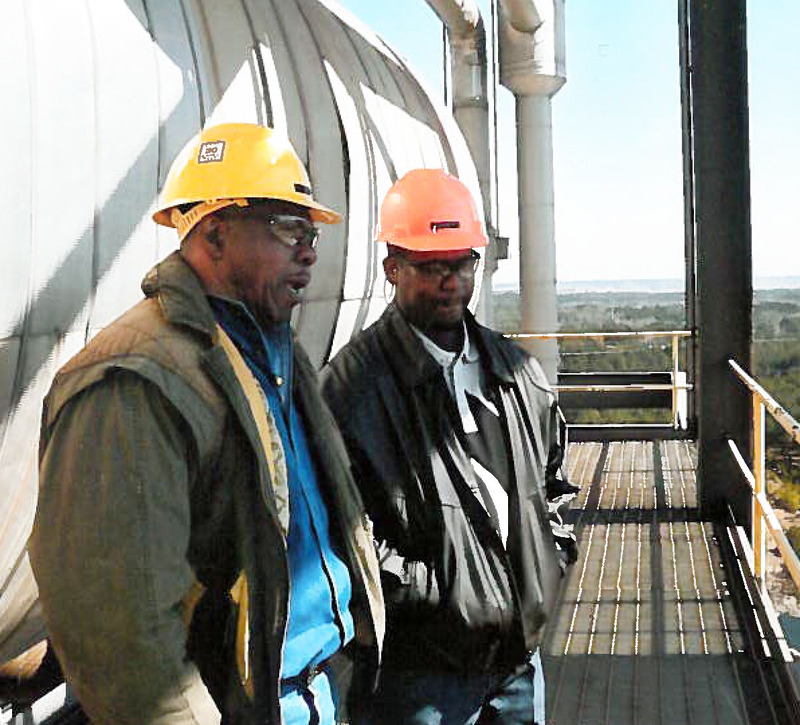 Oliver Jefferson (left) speaks with current Longview Lineman Brandish Haynes at Pirkey Power Plant. The Second Annual Oliver Jefferson & Russell Nance Memorial Golf Tournament will take place at Wood Hollow Golf Course in Longview, Texas. Money raised from the tournament will go toward scholarships that have been established in their names at Texas State Technical College in Marshall, Texas. 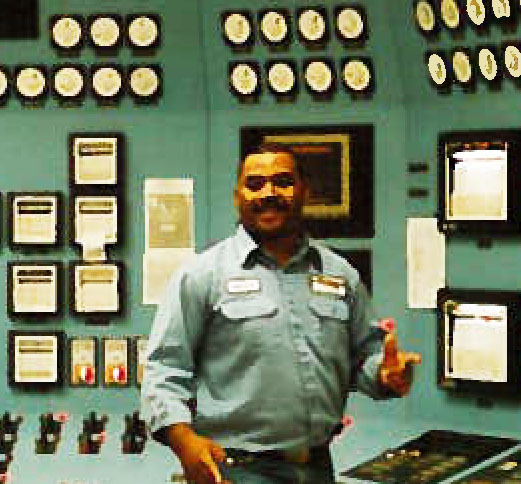 Jefferson, who was born and raised in Haughton, La., retired from SWEPCO as operation superintendent at Pirkey Power Plant in 2010 with 37 years of service. Nance, who was born and raised in Mount Pleasant, Texas, retired as a supervisor after more than 25 years of service at Welsh Power Plant. Nance passed away in 2011 after suffering from Lou Gehrig’s Disease. About five months later, Jefferson died of a heart attack. Co-worker Kenneth “Boomer” Bates said the golf tournament is being held in honor of the employees, because they gave so much of themselves to their communities and the people they worked with. The four-man scramble begins with lunch at 11:30 a.m., with shotgun start at 1 p.m. Cost is $65 per person and includes lunch, soft drinks, a memorial t-shirt and green/cart fees. Mulligans and drives may be purchased for $5 (four max per team). Plaques will be given to members of the top two teams. Closest to the hole and longest drive prizes will be given, including Titleist Pro V1 golf balls and a Yeti cooler. Russell Nance taking hourly readings in the Welsh control room. For non-golfers, T-shirts are available for $15, with proceeds going to the scholarship fund. Tickets are also being sold for $1 to win a one-day dove hunting trip to Fin, Fur and Feathers in Sulphur Springs, Texas, under the guidance of Welsh employee Steve Fielder. Deadline for T-shirts and to register is May 17. To register or purchase a shirt, contact Kenneth Bates of Welsh Power Plant (home: 903-855-7009, work: 903-853-4999, cell: 903-767-0647). Tickets to win the dove hunting trip can be purchased from Bates or Fielder at 903-563-5328. The first memorial tournament held last year was a success, and Bates expressed his appreciation to all employees for their support.